We hope you all are enjoying Passover and/or spring break. As we stop briefly into a lightly staffed office today, we offer you a few examples of doodles found within Federation Public Relations files. 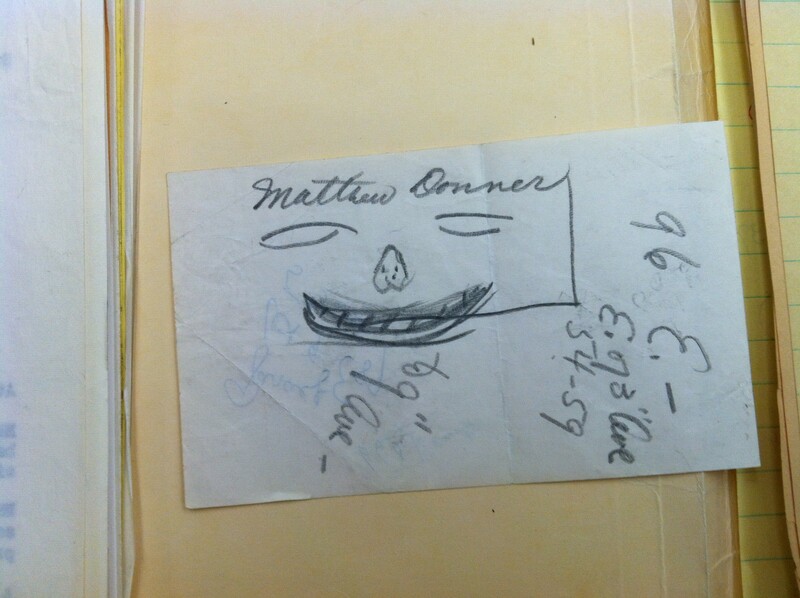 The documents, upon which the doodles appear, date from the 1960s. 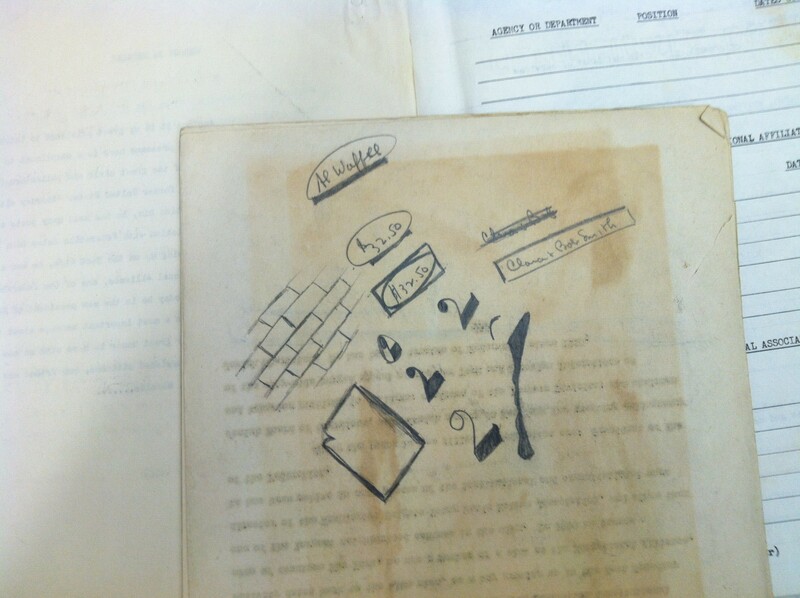 I can imagine these doodles being drawn by workers daydreaming of being elsewhere. The processing of the files of the UJA-Federation (UJF) Executive Vice Presidents (EVP) is now complete! Ernest W. Michel (1986-1989), Stephen D. Solender (1986-1999), and Dr. John S. Ruskay (1999-2014) will soon be accessible and open to use by researchers, spanning the years of UJA-Federation’s existence, from 1986 through 2000. The completed UJF EVP files constitute 167 linear feet. The files of Stephen D. Solender (SDS) and John Ruskay include chronological correspondence, general correspondence, and subject files. The alphabetical subject files of SDS alone are voluminous (over 100 linear feet in material). They arrived from storage in three separate shipments which were arranged separately and integrated intellectually. Both Solender and Ruskay were visionaries in Jewish communal service. Upon his retirement from UJA-Federation in 1999, SDS became President and CEO of the United Jewish Communities (UJC), and the archive includes documentation of Solender’s early involvement with UJC. The United Jewish Communities was an organization incorporated in 1999 as a result of merger discussions held between representatives of the Council of Jewish Federations, (CJF), United Israel Appeal (UIA), and United Jewish Appeal (UJA). 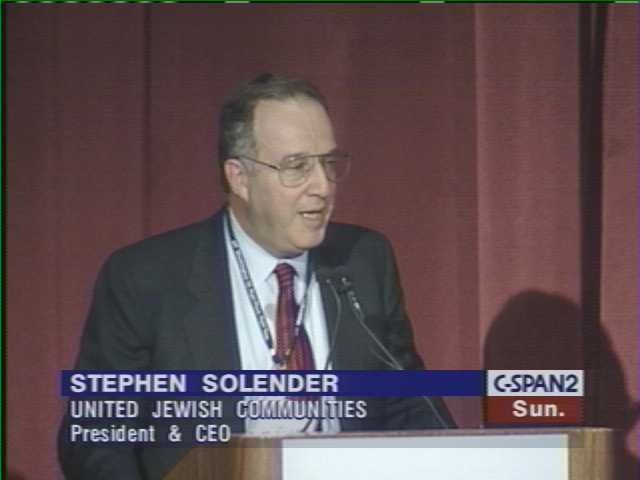 Pictured below is Solender at a public affairs event in 2000 (see also http://www.c-spanvideo.org/stephensolender). 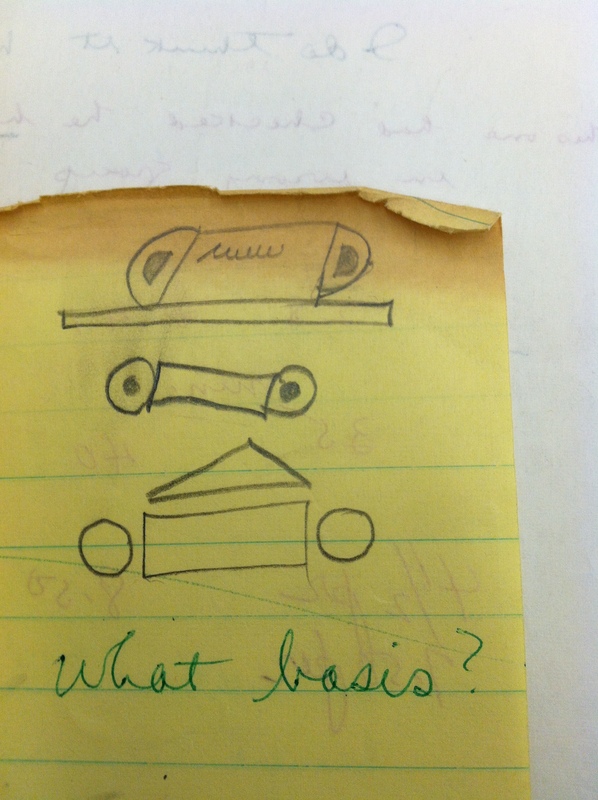 Solender’s files cover a myriad of topics that UJF was involved with in its earliest years. Among them was the Capital Campaign, a campaign focused on earning funds for building and rebuilding the facilities of its beneficiary organizations. His files also document his involvement in UJA-Federation’s many committees. The files include his correspondence with international agencies such as the Joint Distribution Committee (JDC) and the Jewish Agency for Israel (JAFI), continuing UJA’s work overseas. 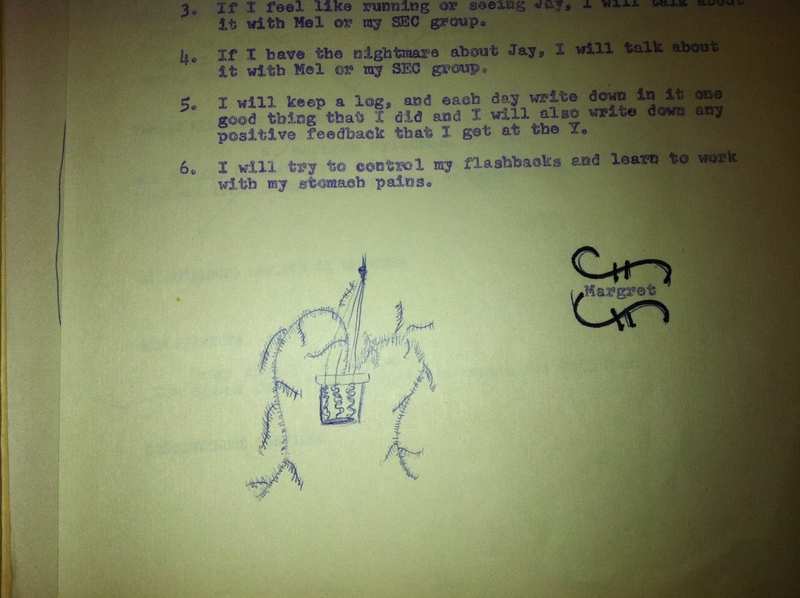 Solender’s files contain discussion topics with other UJA-Federation leadership, and the first evidence appears of substantial, permanent correspondence by e-mail. It is clear from the contents of the files that the best way to archive e-mail in the late 1990s was by printing it out and filing it in subject folders. There is some material concern the year 2000 and the future vision of UJA-Federation. A significant amount of topical overlap exists between the UJF EVP Subject Files and the UJF Budget Department Subject Files. John Ruskay’s files were also recently processed, comprising 7 linear feet of material, representing his files up to the year 2000. His later files are not part of this project as they are still current and in active use. His files include his involvement with UJF’s Program Services Department prior to his becoming EVP of UJA-Federation, as well as his correspondence with outside organizations affiliated with UJF such as the Taglit-Birthright Israel program. 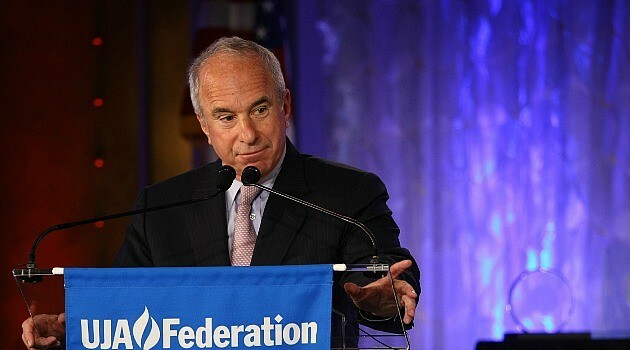 In his fifteen years as EVP and CEO, Ruskay helped raise $2.7 billion for UJA-Federation and increased its endowment from $330 million to $880 million. In his weekly newsletter “From the CEO,” Ruskay touches upon many important issues to the Jewish community, ranging from Jewish poverty, aging, disaster relief from Hurricane Sandy and government relations. Pictured below is an image of John Ruskay announcing his resignation (http://forward.com/articles/175333/john-ruskay-announces-resignation-steered-federati/). A complete finding aid to the EVP files (both FJP and UJF) is currently in progress and we will post a link to it in a future blog post as soon as it is completed.